Q: What's better than tender gnocchi in Alfredo sauce? A: Those same delish ingredients in a bubbly casserole with a cracker crust. Combine cracker crumbs, thyme and butter. 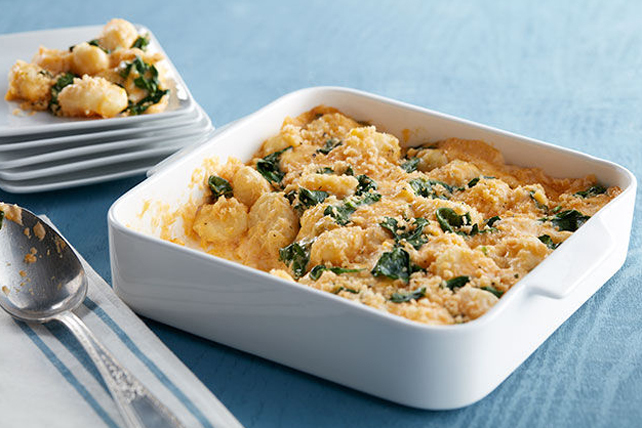 Microwave gnocchi, spinach and water in 2-L microwaveable ovenproof casserole dish on HIGH 4 min. ; drain. Return gnocchi mixture to casserole dish. Add remaining ingredients; mix well. Sprinkle with crumb mixture. Pair this creamy classic with a simple side dish, such as steamed broccoli or a crisp mixed green salad. Gnocchi is an Italian version of a small potato dumpling. Look for it in the pasta aisle of your grocery store.